It’s quite easy, but if things seem to be a bit tricky first: Keep in mind that even Germans have to figure these things out when they move to a new city. So here are a few information about our public transportation system, car sharing, driving schools, bicycle rent, and our very special pedestrian traffic lights. Coming straight to the point: Düsseldorf is not a great city for owning a car. The traffic is bad, some streets are narrow, parking opportunities rare and / or expensive. If you have a car you need to have your own parking space when you live close to downtown. 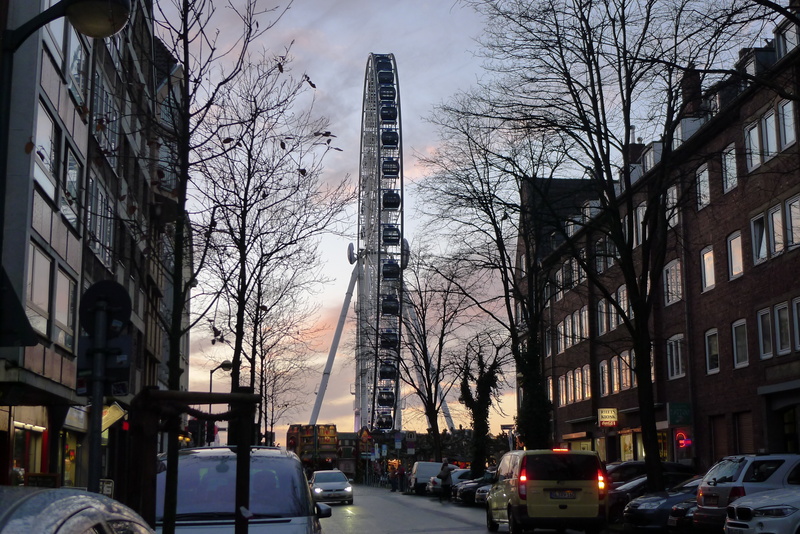 The city of Düsseldorf offers an overview of almost all parking garages where Düsseldorf residents can rent a garage. But you can also use car sharing services like car2go, DriveNow, or Flinkster if you need a car just from time to time. People here usually obey the traffic rules (more or less), stop at traffic lights, sometimes use their blinkers, usually let pedestrians use crosswalks, and some even adhere to speed limits. So despite the usual chaos especially during rush hour the traffic is okay. If you already have a driver’s license that allows you to drive here without an additional test I would recommend maybe one or two hours at a driving school to make sure you understand and are comfortable with the local rules and the traffic in Düsseldorf. The good news is we have many driving schools that offer classes in languages other than German: For example Fahrschule Korte in Eller offers lessons in English, Croatian, Spanish, and Turkish, Academy GO! Fahrschule in Benrath and Eller teaches in English, Polish, and Russian, Fahrschule Crash Kid in Benrath in English, Russian, and Greek. In Duisburg-Hochfeld Fahrschule Rezai offers lessons in Persian/Farsi and English, they also speak a little French. Fahrschule Poleposition in Wersten and Fahrschule Ludwig in Derendorf and Flingern offer classes in English. I can’t speak to the quality and prices of these schools, but you might be able to find more information about them on Yelp or from other expats. If you don’t mind riding a bicycle in the city – usually the traffic here works well for bike travel – you can buy a new bike for example at Bicycle Doctor, Lucky Bike, Zweiradhaus Eller, and Düsselrad (they have used bikes, too). At Schicke Mütze they’ll help you fix your bike and you can enjoy a coffee in the little café afterwards. If a used bike is what you’re after look on Ebay Kleinanzeigen, or Kalaydo. Another place to find a used bike is one of the local flea markets… but I’m not sure if all of them are „legal“. If you need a bike just for a few hours there are also a few bicycle rental options: Nextbike, Radstation Düsseldorf, or Call a bike. Even for e-bikes Düsseldorf has an offer. 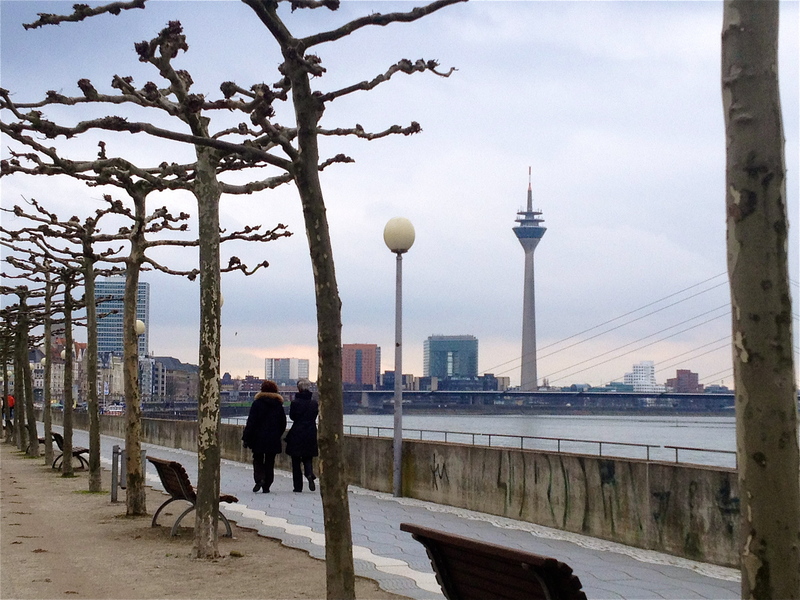 While you can’t compare the intervals with larger cities like Berlin, Cologne, or Hamburg, connections in Düsseldorf are good. The inner city transportation is run by busses, trams, and by railway (U-Bahn). You can look up your connection on the Rheinbahn website or via their app. A typical ticket within the city costs 2.60€ and is valid for 90 minutes. There are also short distance tickets for 1.60€, but you can only buy those if your trip is less than usually 1.5 km (approximately one or two stops). Make sure to look at the tables at the stations or at the Rheinbahn website or app to make sure you buy the correct ticket. You can buy tickets from the ticket machines on the tram (in the front part) or from the driver when you’re taking the bus. Unlike the tram, when traveling by bus, you have to show the driver your ticket when you enter. It’s also possible to buy tickets at most stops, but be careful if you would like to buy in advance: Single tickets are usually already stamped. Another option is the online ticket app (not available for Windows). Trams halt at every stop, so no need to push the “Stop” button. But if you would like to get out of the tram and the door doesn’t open automatically you need to. However, on the bus you must press the “Stop”, so the driver knows you would like to get out at the next stop. If you use public transportation regularly I recommend getting a monthly subscription.If that’s not for you, consider tickets for four or ten rides or a day ticket, all of which are cheaper than a single fare ticket. Even if parts of the Rheinbahn vehicles also run to other cities its main net is within Düsseldorf. When you visit other cities in the region you usually take the S-Bahn (suburban railway) which also has several stops all over the city like e.g. Volksgarten, Zoo, Bilk or Unterrath. The regional express (RE) is another faster option, but it has just a few stops in Düsseldorf (main station, airport, Benrath). There is also the regional train (RB), but it only stops at the main station. These lines are run by Verkehrsverbund Rhein-Ruhr (VRR), they have an app too. You might also find the information for refugees in different languages on their website helpful as they might have the same questions as everyone moving to a new country or city. When traveling longer distances you can use the InterCity (IC) or InterCity Express (ICE) via Deutsche Bahn (DB). The timetables can be found on their website or their app. If you want to discover other parts of Germany without spending a lot of money, check out these options: Schönes-Wochenende-Ticket, Quer-durchs-Land-Ticket, and Länder-Tickets. Also, if the systems seem confusing – it is, even for Germans. But don’t worry, you can use the app and also always ask for help at the Deutsche Bahn office in the Hbf (Hauptbahnhof = main station) if needed. There’re some bus companies offering national and international connections. And most of them are cheaper than the Deutsche Bahn. So always check Eurolines, Flixbus, Onebus, Ouibus, and Postbus if you’re a budget traveler. One special thing in Düsseldorf is the traffic light for pedestrians: All over Germany they are just green and red, but in Düsseldorf we have a yellow light too. Don’t take the yellow light as a license to move slowly – when the light turns red the cars get a green. So hurry up when you see the yellow light or wait as a precaution if you haven’t seen it turning yellow. After a short time you’ll get the feeling for the rhythm, in the end the pedestrian lights just work like the ones for cars you already. Of course! But this is enough for now. I’ll continue posts about daily life – such as supermarkets, doctors, craftsmen, pet sitters, and so on.